This news is just CRAZY. I just got hold of this news today. And when I found out who's going to come to the Philippines I already freaked out. I honestly thought it was just going to be a small one but seeing PSY, SHINee, CNBLUE, B1A4, BAP, BTOB and my favorite ladies from AOA... this is huge! But what actually is more impressive is the cause o this campaign. World Peace? Is it acheivable? Is it possible? Yes it is. This campaign is asking for international support together with 800 non governmental organizations calling for the reunification of Korea. Seo In-teck Co-chair of Action for Korea United (AKU) and President of the Global Peace Foundation Korea Chapter says they want to push for this civic-led campaign for Korean reunification, a development that could help promote regional stability and build a new economic powerhouse in Asia. 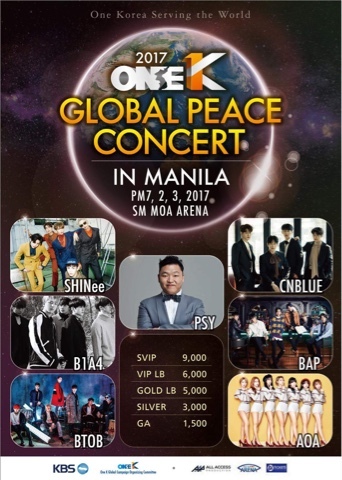 This is monumental if you think about it and having these artists in one place already means a lot, because they believe in the cause and they are putting together Korea's biggest artists at the Mall of Asia on March 2-3, 2017. Party starts at 7PM and you're not just having a great show, you'll also be helping achieve dreams of our neighbors as they become ONE KOREA!